My Dog Eats Grass - Is it Safe? My Dog Eats Grass – Is it Safe? Do you think it’s odd that your dog loves to eat grass and does it cause you to worry? Well, for the most part, you can stop being concerned. A dog eating grass is a natural behavior for all dogs, be they wild or your best friend. Coyotes, dingoes, and wolves have all been observed eating grass. 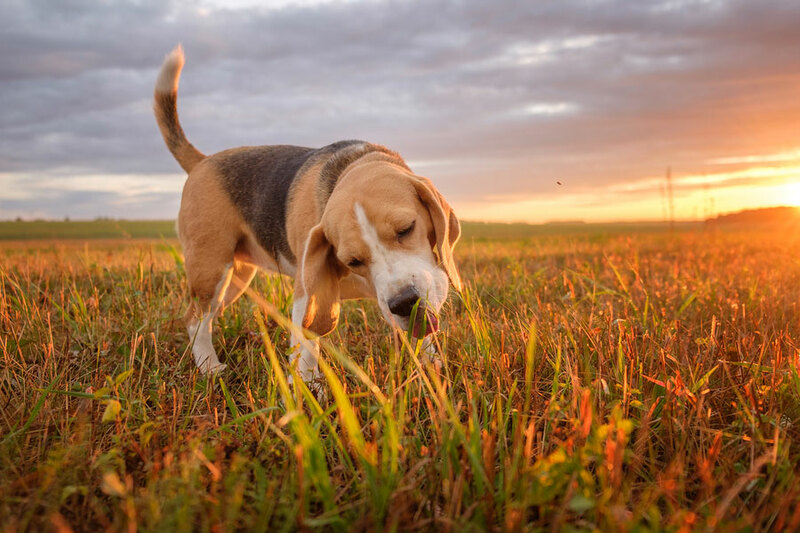 Grass is healthy for your dog – it’s a rich source of fiber and roughage, it’s full of phytonutrients, and it has high levels of potassium and chlorophyll. Why Does my Dog Throw up After Eating Grass? Many people believe that dogs eat grass just to make themselves throw up. However, just nibbling on grass won’t cause your dog to vomit. On the other hand, if your dog is gulping down a fair amount of the green stuff, he may be doing so because he’s trying to settle an upset stomach. The grass blades tickling the dog’s throat and stomach lining may induce vomiting and provide some relief. Here are some other reasons that a dog eats grass. To help with intestinal worms. Because it tastes and/or feels good. When isn’t it Safe for my Dog to Eat Grass? Cultivated grass can be toxic so keep your dog away from those super-green lawns where herbicides or pesticides may have been used. These substances are poisonous to your dog if ingested. I Think my Dog is Eating Too Much Grass, What Should I do? If you think your dog eats grass because he’s bored, maybe he doesn’t have enough to do. Make sure he’s getting enough exercise and play time with you. If your dog eats grass to get more fiber, take a look at your dog’s diet – does it have enough fiber in it? You can increase the fiber content by adding some raw or lightly steamed fruits and vegetables to your dog’s food. Dog-friendly fruits and vegetables include broccoli, carrots, green beans, snap peas, sweet potatoes, cucumbers, apples (no seeds), and bananas (no peel). Click here for a list of fruits and vegetables your dog can eat and should not eat. If your dog doesn’t have an upset stomach and there’s enough fiber in his food, don’t worry too much if your dog eats grass. However, there are other things he may have eaten which are definitely not ok. Some human foods are toxic to dogs, e.g., chocolate, grapes, raisins. Click here for a slideshow of things that a dog should not be eating. If you think your dog has been poisoned by eating something toxic, rush him to a vet immediately. Emergency treatment may also be necessary if your dog has swallowed an object that might be stuck in his intestines – e.g., string, a fishing hook, a large fruit pit. If you live in the area of Columbia, South Carolina, CVETS is fully prepared for any emergency caused by your dog ingesting something that’s not safe. So, bring him to us – his life may depend on it. Next PostWhat Causes Kennel Cough in Dogs and Cats?